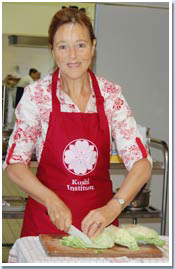 Wieke Nelissen is a leading cooking teacher in the international macrobiotic community and has been an active teacher for over 30 years. She has written many articles for various macrobiotic publications, and designed many original dishes. simplicity and are easy to prepare, tasty, colorful and family-oriented. Since 1978, Wieke has been the co-director of the Kushi Institute of Europe, together with her husband Adelbert Nelissen. They have 5 children and 10 grandchildren. In a covered frying pan simmer the tofu in the shoyu and the lemon-juice during 2 minutes, turn the slices and simmer 1 more minute.